It’s taken me a while to write this post. It has a lot to do with a lack of spare time, but when I have had time, I’ve still struggled with it. I’ve rewritten this post several times over the past week or so, never happy with what I’ve said or the conclusions that I’ve reached. I think it’s actually the pursuit of a conclusion, the need to have something to say and not just report the things I saw/tasted, that has hampered me. I wanted to directly compare the Great British Beer Festival and the London Craft Beer Festival. The scheduling overlap of putting LCBF right on the closing weekend of GBBF makes it clear: this was what the organisers of the LCBF wanted us all to do. Compare. Contrast. I even saw people on Twitter two weeks earlier asking whether people would pick one, or both. Whilst there was nothing as tangible as an actual competition or rivalry between GBBF and LCBF, there should definitely have been closer examination of what these two festivals represent in the modern beer landscape. At least, that’s what I thought at the time. … and in the red corner: LCBF. The truth is that they can’t be directly compared. With GBBF, we have a firmly established behemoth of the British beer scene, stocking over 800 beers in the enormous and beautifully lit surroundings of Olympia. LCBF is a far trendier, tight-jeaned urban animal, nestling in Hackney’s suntrap/gig venue that is Oval Space. Comparing attendance figures would be like comparing those of Premier League and Conference football matches, and sheer size is not really the point of a beer festival. It’s the experience and the beer that we actually drink, not see, that we measure beer festivals by. My experiences and the beers I tasted were so vastly different that, again, they defy comparison. Standard perspective shot of some pumps taken at a just-as-the-beer-takes-over angle. At GBBF’s trade session on Tuesday, I bumped into CAMRGB’s Simon Williams. We were stood by the Bieres Sans Frontieres Bottle Bar (AKA The Globe), which I had sought out expecting to find people I knew there. But the USA cask bar, The Spirit of Enterprise, was on neither side of The Globe, as normal. “I’m looking for my friends, you know, all the Craft Wankers,” I explained to Simon, who pointed me to the other hall, where the USA cask bar was located. 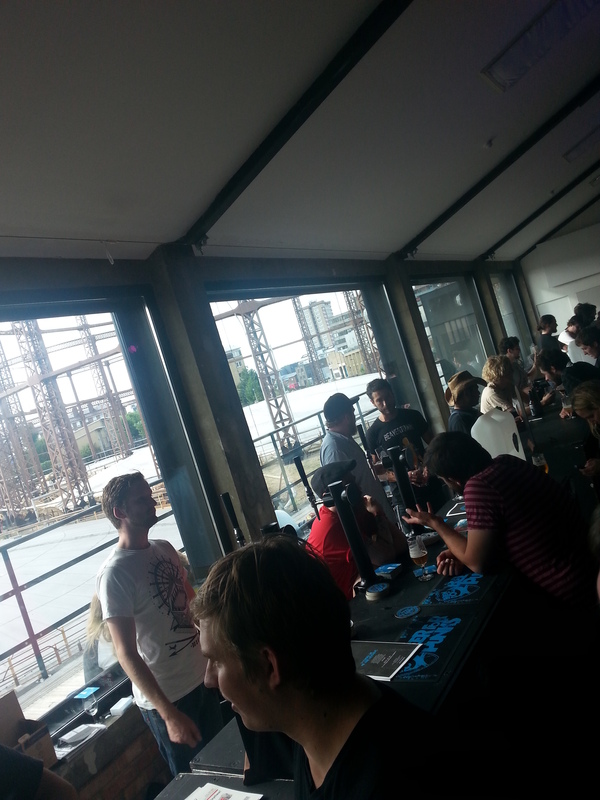 Off I went, and indeed I found a veritable Growler of high-quality Craft Wankers propping the place up. My girlfriend remarked “Oh my God, he was right!” There was even a chap with the names of four varieties of wild-fermenting bacteria on his t-shirt. Seriously. I eventually met with several fine people, and drank a great deal of good beer. But given the hype, the excitement, the brewers and the beers themselves present, few were better than just ‘good’. It almost seemed a cruel joke in a way, that the hugely popular bar of American imported draught beers were a) on cask, and b) all right but rarely incredible. Many remarked that they needed to be served by keg or bottle to be at their best. Craft wankery? Perhaps. But it was hard to deny the truth in it. 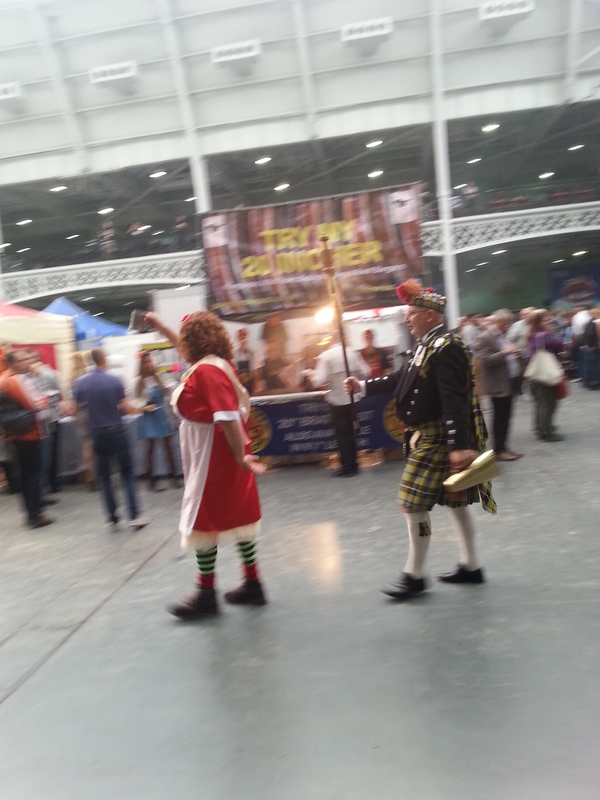 There was also the occasional bit of GBBF Weirdness (see below). The juxtaposition of a Cornish wrestler dressed as Betty Stogs and a hot dog vendor’s sign saying ‘TRY MY TWENTY INCHER’ was almost too much for this correspondent. 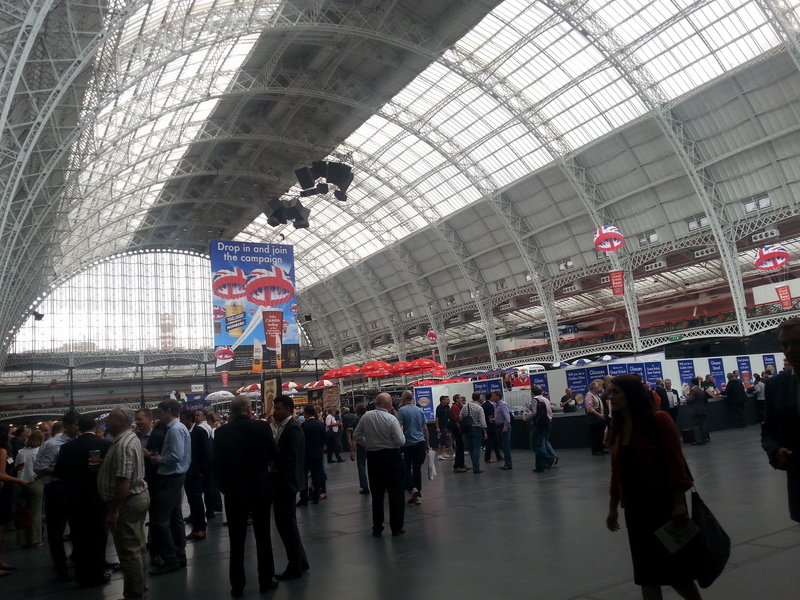 On Saturday, the chaotic, barrel-scraping end to GBBF was in full swing by the time I got there. Maybe 60-70% of the beers on most bars had gone, so it was a case of plumping for whatever was selling and looking good. I had a couple of so-so golden ales, then came across a few delights. My focus on Saturday was on British beer. I’d stuck mainly to the USA cask, Belgian/Italian cask and BSF bottle bar on Tuesday, and felt that I ought to seek the very best British beer I could find. I was hoping to replicate my moment of elation at last year’s GBBF after trying Oakham Green Devil for the first time. I couldn’t find a beer to match it this year, but I came close a few times. 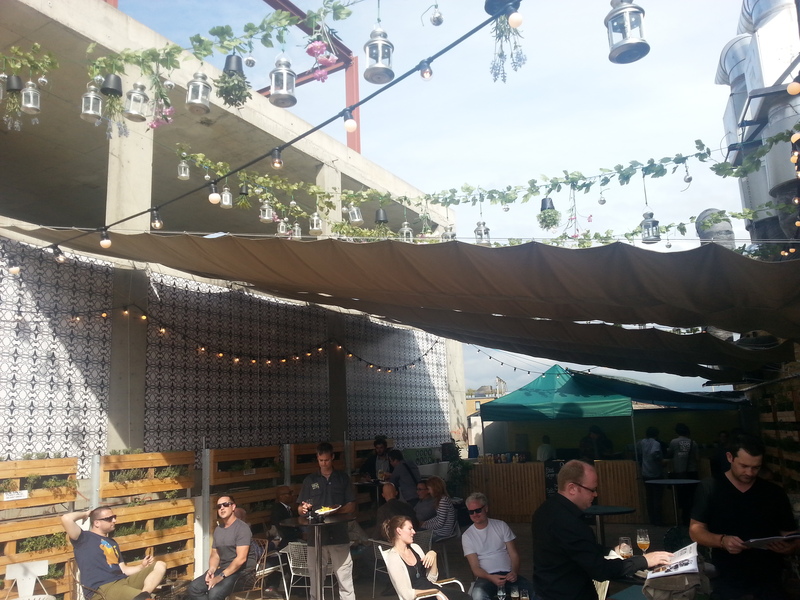 How many things can you hang above a terrace? Quite a blummin’ lot, mate. At LCBF meanwhile, I expected a similar situation on a larger scale. Again, I went on a trade/press session, this time on Friday afternoon. Instead, I found that the crowd was more varied than I might expect. Sure, there were a lot of Hackney People, who work in Those Sorts Of Shops and have friends who laugh Very, Very Loudly, but for the most part it was a very relaxed, eclectic crowd. Trade sessions, however, are not always the true litmus test of these things I suppose. I spent most of my time up on the shady terrace, chatting with nice beer people, drinking increasingly excellent beer and feeling far more relaxed than at GBBF. The other outside area, a long sunny balcony, had a slightly too oppressive view for my mood. Who controls the craft controls the universe. LCBF’s large indoor space was covered on three sides with bars, with beers from Five Points, De Molen, Weird Beard, Beavertown, Magic Rock, Kernel, BrewDog, Alpha State, Partizan, Brodies, Siren, Redemption and more, all served from keg. The conditioning, temperature and quality of all the beers I tasted on Friday was impeccable. Easily the most consistently good quality dispense I’ve experienced at any beer festival in fact. I’ve been served cask beers in better nick on occasion, but far, far more rarely than I would like. Siren’s Limoncello IPA was on top form, as was Partizan’s Camomile Saison and Magic Rock’s Lime Salty Kiss. Each beer I had at LCBF was an absolute delight. 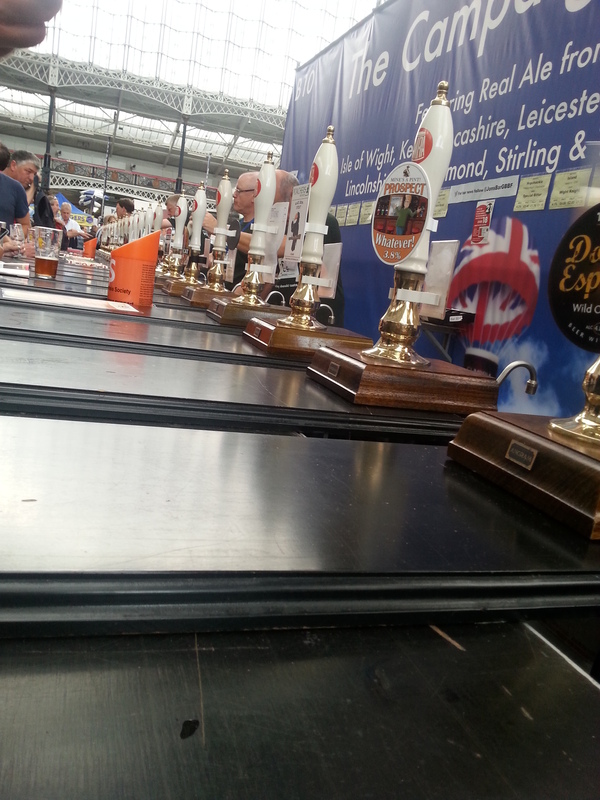 GBBF’s dispense quality varied from bar to bar, beer to beer, but overall was still very impressive. The occasional dud was normally offset by something quite sublime. It was great to taste the Malt Shovel Mild, brewed by Fernandes in Wakefield. Aside from it being a really great mild, I have fond memories of drinking in their brewery tap (the fittingly named Brewery Tap) back in my student days. There was some great weissbiers being served on the German and Czech draught bar, especially the Josef Greif (for which I was given grief for pronouncing it grief when it should be said grife). 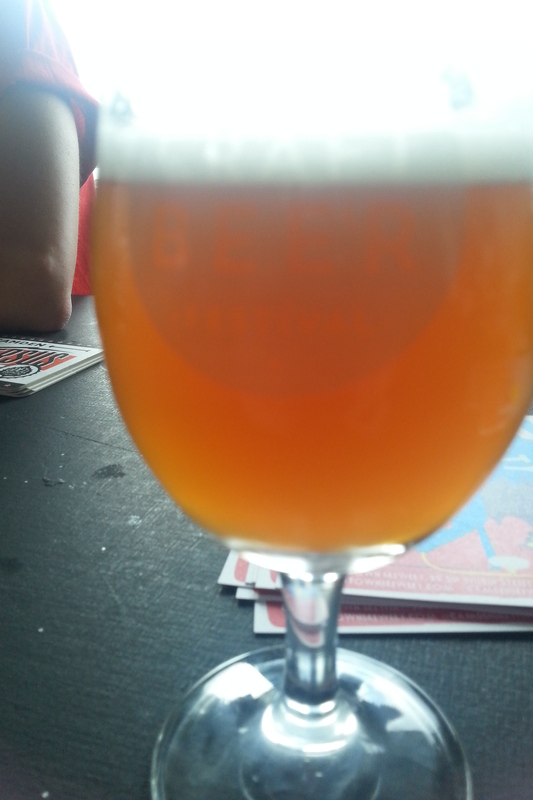 Though, if I had one regret from Saturday at GBBF, it would be not spending more time at the SIBA bar, where I had a magnificent specimen of Kirkstall Dissolution IPA. So, if I can’t compare the two beer festivals directly, and I had a great time at both, what can I say that’s worth saying? For starters, both festivals are a measure of the health of the beer scene. Whilst we are starting to hear of closures of newer breweries, indicating an imminent plateau, there is also a steady increase in the number of beer festivals that aren’t organised by CAMRA. These may be run by people who just want to make money, they may be run by people who simply want to be the best at it (Craft Beer Rising are probably leading that particular pack). The most important thing is not just that the current beer ‘scene’ in London, such as it is, can sustain two vastly different beer festivals, but that they can be happily attended by the same people. It might not be an earth-shattering conclusion, but it’s the only one I can really get behind. We have a vibrant culture of beer that is creating excellent events and encouraging the brewing of even more excellent beer. So let’s all enjoy it while it’s here. I loved that guy with the bacteria genus names on his t-shirt. SCIENCE! 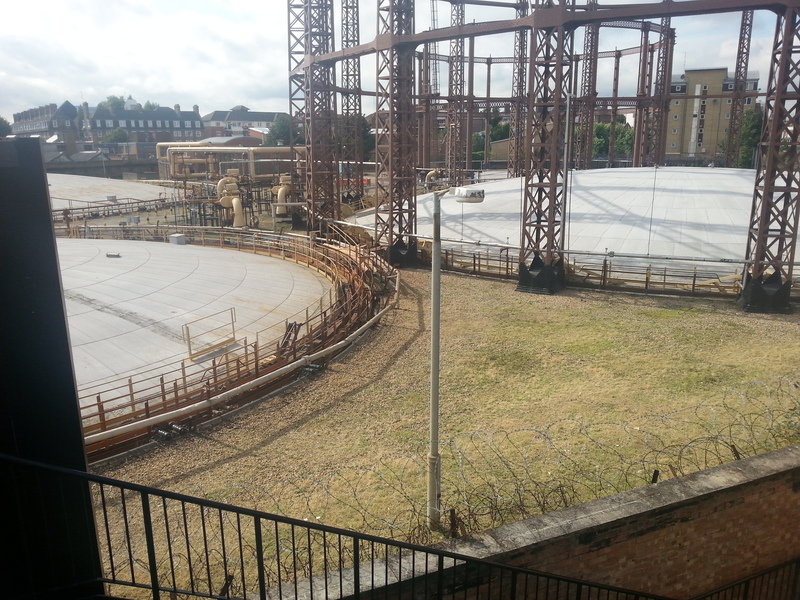 If the writer believes that the Oval site is in Hackney why should we believe anything else that he writes? Perhaps he has gone off pitch? I did enjoy the comparisons.